We offer personalised plans for everyone and can help you to fit training around your current lifestyle and commitments. Learn how to make the most out of every ride, using whatever time you have available to increase your fitness. Push your limits more than you ever would on your own and feel the best you’ve ever felt, both on and off your bike. Whether it’s a race, a sportive ride, or Lands End – John O’Groats, we can make sure you prepare optimally for your target event and reach peak fitness at just the right time. With years of race experience between us, we are well placed to offer expert advice to the budding professional rider. From base miles to tactical race-craft, we can get you on the right track, heading towards podium. Who would benefit from cycle coaching? You don’t need to have your sights set on a professional career to be a coached rider. We work with all sorts of people who each have their own unique reason for wanting to be better on a bike. You don’t need to have all the best gear, the latest tech, or an expensive bike to get a coach. We love data, don’t get us wrong, but being a better cyclist is essentially about trying hard. Good old fashioned grit and determination! If you’ve got a power meter – great, but don’t worry if you’ve not got gadgets. We can work with whatever you use. When you join Holmes Cycling we first of all setup an initial consultation. Ideally this will be a face to face chat, but if necessary can be done remotely by phone or internet. Having this introductory conversation allows us to understand your previous cycling experience, current level of fitness and future ambitions. It also allows us to get to know each other a little before we start working together. If you live in the North West, Roy is likely to suggest you go for a casual ride together for the consultation, which is a great way for us to see first hand the type of rider you are. As a result of the initial consultation we can help you establish your overall goals and create a training plan in line with these targets. We take a broad view of all areas in which we feel improvements can be gained, favouring a long term approach to addressing any weaknesses and harnessing strengths. To accurately monitor progress we also arrange some testing which will identify your personal training zones using Heart rate and Power. We use Training Peaks to set session plans and these are emailed to you each day. Each session you receive will contain full details of your planned workouts, so you’ll always know exactly what you need to do each day. Sometimes your plan for the day will just be to rest! Training Peaks allows us not only to structure your training but also to analyse it and provide continuous feedback. 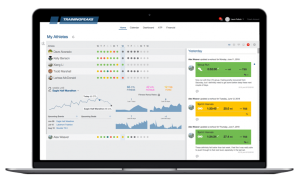 As a tool for athletes and coaches alike, Training Peaks web based software is the best way to manage your training and monitor how well you are responding to the workouts. It is our firm belief that great communication is at the centre of successful coaching. We encourage all our athletes to give us feedback via Training Peaks after each workout. This helps us monitor your progress more effectively and tailor things more personally. Tell us how you felt during a ride. Tell us if you enjoyed the structure of the session, or not. Tell us if your knee hurts… Everything is important. Your coach will give you feedback each week and overall progress will be reviewed each month. We use Training Peaks online diary software to support every stage of our coaching. This provides us with powerful tools for planning, tracking and analysis. In addition, we use Training Peaks to provide you with feedback after your workouts. Once set, you can simply download the details of your workout onto compatible devices such as your Garmin or into your virtual training software, ie. Zwift or Trainer Road, and start training! In addition to Training Peaks online diary software, we also use WKO4 to analyse your training in even greater detail. This software helps pinpoint your strengths and weaknesses, as well as tracking changes in your fitness.